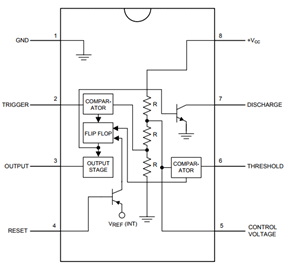 Typical operating voltage is +5V, can withstand a maximum of +18V. Operating Temperature is 70 degree Celsius. Note: The above values are mentioned for PDIP package, Complete Technical Details can be found at the datasheet given at the end of this page. 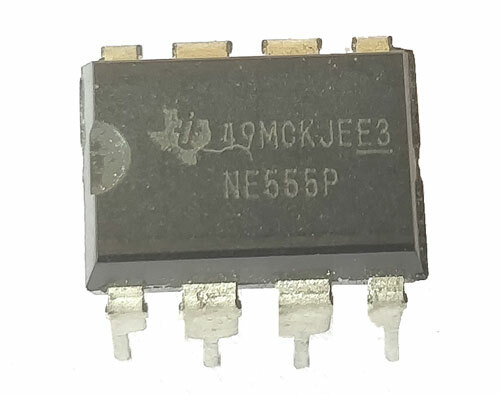 There are three resistors of value 5K, which gives this IC it’s iconic name “555 Timer”. It has dual comparators and flip-flop which will make this IC operated in three different modes such as Astable, Monostable and Bistable(Schimitt) Mode. In Monostable mode a pulse of pre-defined length is produced when a trigger button is pressed. The output pin stays low until the button is pressed and once pressed it remains high for a period of time decided by the value of resistor (RA) and Capacitor (C) shown in the below circuit. The Bi-stable mode is also called as Schmitt Trigger Mode. 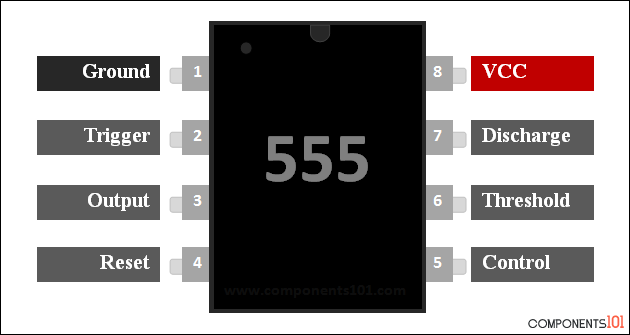 This mode is used when a load has to be turned on and off using a push button. This mode does not have major practical importance hence it is rarely used.